Hello again, and thanks for joining me. I’ll demonstrate every step of the crafting process and share many additional tips along the way. Be sure watch until the end to find out how to get the pattern as well as additional information. I will provide chapter markers in the description if you wish to skip ahead at certain parts. I will of course try to keep the video concise, but I also want to ensure that anyone attempting this project gets adequate educational value, so there may be parts where I repeat information that may be present in previous tutorials. But I will also try to use each tutorial as a way to teach new techniques as well so if you are using this tutorial to learn be careful about which parts you skip. Once again thanks for checking out this tutorial. If you end up finding the content interesting or useful, its actually very easy to give back. If you like, comment, share, and subscribe; any of those things will help boost the signal which helps me and and might help others wanting to learn the craft to find this video as well. I really appreciate all the support you all have shown so far. We’re already up to over 6500 at the time of recording this. Thanks again! Alright, let’s get the tutorial started. Bracers are an accessory item that are worn on the wrists and are a great project for beginners. 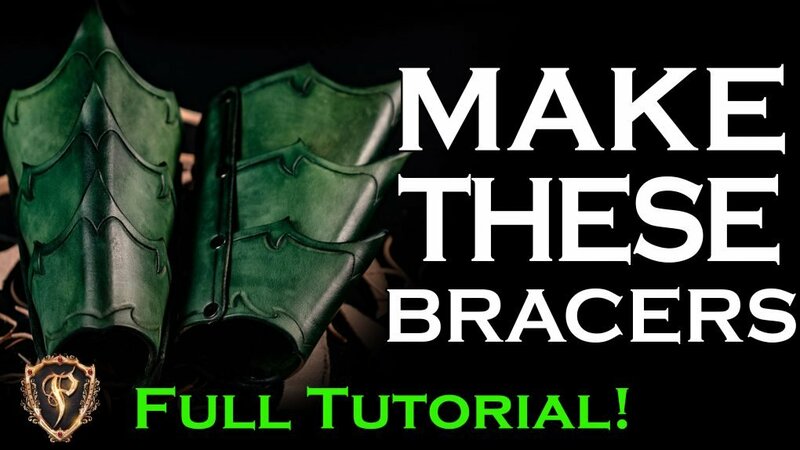 The bracers I’ll be making here will be a one size fits most but if you are following along with the patterns, consult the provided document for fit and sizing tips. I’ve printed the patterns out onto normal computer printer paper. Once you have the patterns cut out you will carefully trace around the edges of each pattern with a fine point marker. You can use a pen but beware of ink smudges. As I transfer the patterns to the leather I am also using a ballpoint pen to indicate the centers of the holes that will be punched out later. You can do this same method or mark the entire hole. One thing I wanted to point out this time is that the dashed line on the patterns indicates the secondary style. The base design is the same for both styles but one style is sharp and angular, and one style is more rounded. Why you would choose one over the other is completely down to preference. Now we get to the cutting process. I normally make several rough cuts to separate the project into more manageable pieces. You’re free to use any sort of cutting tool you prefer but my go to tool for cutting leather is usually my leather shears. For this project I’m using a heavier weight of leather compared to the helmet tutorial. It is about 12 ounces and takes relatively more effort to cut. You can choose different weights of leather depending on what you’re wanting to do. When using shears there are a few things to keep in mind. One, you need to be mindful of the angle of your cut. Try to maintain a consistent and perpendicular cut at all times. Second, is cut uniformity. As you are cutting, try to keep the cut seated into the blades of the shears so when you reset the cutting stroke you avoid choppy and jagged cuts. When you finish your cut, and you look at the edges, can you tell the cut was made with multiple chopping motions? Or does it look like one smooth cut from start to finish? And third, if you’re new to leather working, don’t expect this to be easy. Be ready for sore fingers and muscles until you build your hand strength. From the previous tutorial someone asked if they should cut on the inside or outside of the line. I generally cut along the inside of the line to stay true to the pattern. When you trace the pattern, you are in effect tracing on the outside of the pattern, so cutting on the inside of the line compensates for this and trues up the design line. However there are many instances where I will favor a clean cut over staying 100% true to the line, such as if my cutting line starts to drift, I may try to correct the line, but not abruptly because this type of correction is very easy for the eye to pick up as a flaw. Now that the pieces are separated, I like to transfer the designs at this stage. It’s up to you if you want to go with the designs as I have presented here or to come up with something different for your own project. Since the patterns I am providing are meant to be printed on normal printer paper, we will simply trace over the lines with a ballpoint pen. However, it is worth noting that within the realm of leatherworking there are actually many other ways to transfer patterns and I’m sure I’ll cover some of that in more advanced tutorials in the future. To make the tracing process a little easier I will spray the surface of the leather with a fine mist of water. Adding moisture relaxes the fibers enough to take an impression, but don’t get it too wet or your pattern will just get soaked. Give the water just a minute or so to absorb into the leather a bit. When I’m happy with the consistency I’ll overlay the pattern to the piece and trace the design lines accordingly. To enhance the consistency of my lines, I am only tracing the barbed designs and I will be using a winged divider to indicate a clean and consistent border line. You are certainly free to simply trace using the pattern as well. Or you are also free to omit the designs entirely or change it according to your preferences. And now we come to one of my favorite parts which is carving. I’m using my favorite knife which has a straight ceramic blade. It’s not the sharpest one I own but I think I prefer this due to the smooth thick cuts it makes and of course ceramic blades are great with keeping their edge as well. You do have to still strop ceramic blades regularly to keep them gliding through the leather. Before you can do the carving you need to case the leather. The method I am demonstrating here is to simply spray the pieces down with a fine mist and let them sit for a few minutes to let the moisture absorb deeper into the fibers of the leather. There are more complex techniques we could use to case the leather but this method is quick and simple and serves our purposes just fine. I usually go for medium to heavy pressure when making my cuts. It’s actually worth noting that given the thickness of this leather I actually could have gone much deeper with the cuts for a more pronounced edge border. Using a swivel knife for your decorative cuts is just something else that takes a little practice. Its one of those things that can seem intimidating at first, and also cramps your hands at first but in time it becomes second nature. If you follow along with each of these tutorial projects, there’s a great chance that by the time you reach your 3rd project you’ll have a solid grasp of it. Here’s a quick bonus tip: This piece has some long straight borders and since I want to carve the edges with the swivel knife, I’m locking the direction of the blade in my grip and using the ring finger on my right hand as a firm guide and pulling As long as pieces are cut straight to begin with, you can get fast consistent straight lines on your borders as well. This isn’t the only way but it’s how I would normally do it and I can introduce more techniques as we go into future tutorials and guides. The next step is beveling the edges. While this step is also optional, I do recommend you bevel your pieces. The tool I’m using is called an edge beveler and is a number 2 Craftool pro classic from Tandy. I will use it along the top and bottom perimeters of each piece. This will give the edge profile a more rounded radius which will be easier to slick later and serves to give a more finished and professional appearance. Also, if you have any markings along your edges left behind from tracing this will clean that up. Other than using a sharp beveler, one trick to making this process clean and easy is beveling while the leather is lightly damp. Since I previous cased the leather for carving the decorative border cuts, the moisture content is just right. If it was too wet sometimes the leather is too soggy to let the blade get a proper bite and you just end up with wrinkled gouges. You can also do this while the leather is completely dry as well but since I am doing this while it is damp, the beveler can help to get the burnishing process started by compressing the fibers while making the cuts. Another thing to keep in mind is the consistency of the leather will have an impact on the ease and quality of your beveling. Some parts of the hide are more spongey and wrinkly and do not bevel as easily, and lower quality hides with scraggly flesh sides can also be rather tedious to trim. In the next section I’m going to share with you some really great tips on getting very clean smooth burnished edges very quickly and easily, -without- a motorized tool. But first, allow me to take a moment to thank Tandy Leather for supporting these first tutorial videos. Without their support it would have taken much longer for me to produce these for you. 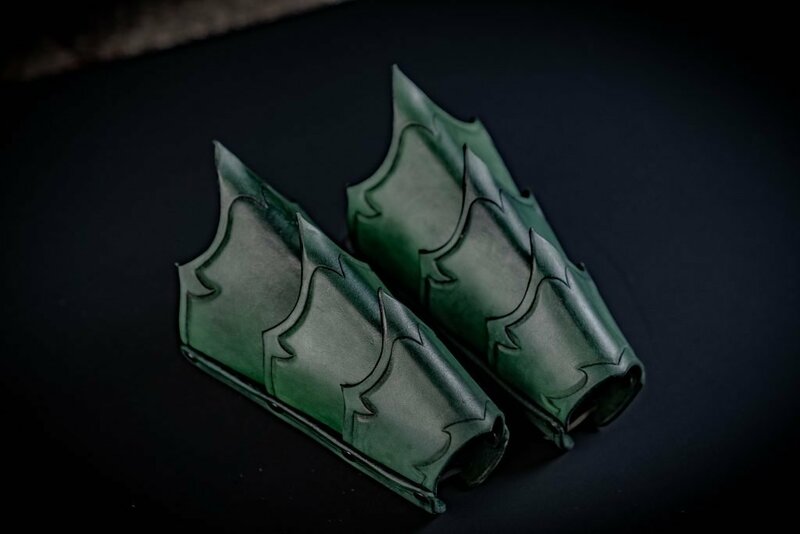 Our interests are aligned in getting new people into the craft of leather crafting and making leather armor is just one of many flavors in this awesome craft. And Tandy has always been the place I would point people to for getting started and where I got started myself. As I mentioned in the getting started video if you go into a leather craft store, they have every reason to help you succeed. They will give you suggestions on the tools and leather you need. And if you can’t make it to a store, I’ll list most of the tools used in this tutorial in the description and you can use my affiliate link below to get the things you need for this project delivered to your door. There are many ways to achieve slick edges. I’m going to demonstrate how I do it for a many of my own projects. This will get you most of the way to perfect edges with about a quarter of the effort. You can indeed get very nice edges using just water and hand tools. The tool I’m using here is a typical wood slicker. Mine happens to be a made from a more dense cocobolo wood but in function is the same as any you can get off the shelf. There are many varieties of these burnishers, but the common factor is they all have various sized notches that roughly fit varying thicknesses of leather so you can use pressure and friction to burnish a rounded profile into the edges of your leather pieces. What is happening when you burnish in this way is you are compacting the fibers along the edge. Its worth noting that typically burnishing means something a little bit different and it has to do with the key word being burn, so you’re using the heat from friction to solidify the edge fibers. but we can go into more specifics on that and more advanced edge finishing options another time. A little finesse makes the difference between this process being easy and simply not work. Getting the right consistency of moisture is important. If it is too dry, the fibers will not compress easily, and if its too wet, the leather fibers will be too relaxed to hold the shape. This concept is something that becomes obvious and a little more intuitive with a little hands on practice. I’m using a mist bottle to slightly saturate the edges, then I will set the edge of the leather into the best fitting groove of slicking tool and rub back and forth with a firm pressure. As you can see here, the edges are now very smooth. As to why you would want to do this process I’ll give you two good reasons. For one, it just makes for a nicer looking end product. And two, it makes wearable or handled items more comfortable to wear and use. Now here’s the one small catch to this process: Although you can use water to achieve the result, to make it last you need to seal it. For most armor projects you’ll be doing this anyway so it’s a non issue. The sealant will help the fibers stay put in their compressed state even through wear. I often will do one final slicking pass as the sealant is applied and starting to dry just for good measure. For the next stage I will be making the holes needed for assembly. I’m using an interchangeable head hole punch to make the holes where the rivets will go. Mine is a shinier version compared to the cheaper one you can get but its basically the same thing. I’m also using a smaller poly board as backing to preserve the tip of the hole punch. There’s not much to it, but I will add that I am using my heavier maul to make the process quicker. Just as quick tip, you might notice how on some pieces the hole punch head will get stuck into the leather. This can be avoided to a large extent by polishing and stroping the head of the tube occasionally. If you do that the punch will normally pop right back out without grabbing the leather at all. The next step is to case the leather again. This time I’m giving it a heavier saturation using a container with water and a high density sponge that I cut in half. I’ll then let it sit for a bit, how long depends on how saturated you get it, how absorptive the leather is, and how fast it dries. You normally wait until the lighter surface color starts returning which means the outsides of the leather is firm while the insides are still damp and ready to hold a tooling impression. Now I’m ready to being the tooling. For this project I’m keeping the design scheme somewhat consistent with the previous helmet project and using a Craftool b206 beveler again for the border tooling. I am tooling to a light to medium depth in this case. You do not have to go with a beveled design like this. I chose it specifically to have a more neutral clean look but you could easily experiment with some scrap and come up with something more exciting to use in your project if you wish. When you’re tooling a line like this, or tooling an area like a background, or anything else requiring numerous repetitive strikes there are a couple of techniques you can try. The technique I often use is to hold the tool into the cut line and apply a mostly downward pressure and drag the tool to the next position over the leather. So I will normally keep the tool seated into the line. Another technique you can use is to hold the tool right at the surface of the leather, and let the tool rebound back up after striking. I will have to make a dedicated tooling video to explain much further but here’s what’s going on in slow motion. I’m keeping the tool seated into the line most of the time here and dragging the tool to the next striking position. You can see how each strike slightly overlaps the previous and I try to keep the force of each strike consistent. And here again from another direction. Depending on how long it takes to tool your pieces, or if you have to step away for a bit, it can help to spray the surface lightly at times. If you were wondering from the helmet tutorial how I fixed a mis-strike in the tooling process, let me show you. So, let’s say you’re tooling your bevels or most any kind of tooling and you lose your rhythm for and strike your tool off the line. With a little work you can hide the crime, and nobody will ever know. Part of the trick is to wet mold and overly stretch the mistake from the back side. I’m just using a marker to do this here. Doing this reduces the detail of all tooling in the stretched area including the mistake. Just stretch it until the mark is mostly gone. Then start burnishing it back down from the top side and smooth out the area. Once your mark is mostly removed you can re tool the correct path and you’re good to go. Leather can be forgiving if you ask nicely. Now it’s time to move onto the coloring process. For these bracers I decided I would use the green Ecoflow waterstain It’s always a good idea to shake up any liquid products before use as most have solutions that will settle over time but just remember, if you shake it more than twice, (censored) you’re playing with it. I like to add the dye to a small container that I can easily dip the applicator into. I will deviate from the Fantasy Helmet Tutorial slightly so I can demonstrate an alternate coloring technique and show you how to get a solid consistent color instead of the textured effect. The process here is fairly straight forward. The main thing is to apply a generous coating to ensure adequate and even absorption into the leather. I’m using a piece of high density sponge to apply the stain to both sides and then taking a shop towel to wipe away the excess. I’ll be using some eco flow satin shene to seal and finish the parts of the bracers again for this project. Using a piece of the high density sponge, I’ll saturate both sides of the pieces and set them aside to begin drying. Before the pieces are completely dry however I will normally take the sponge when it is mostly dry and finesse the surface slightly. Satin shene tends to give a low gloss finish and I will undoubtedly cover other finishes in future tutorials as well. As mentioned earlier, just for good measure I’ll enhance the edges a bit more by burnishing while the edges are just a bit tacky and damp from the finish. Since the leather was rather thick I needed to thin it slightly to account for the rivets. It’s certainly possible to skive the undersides of the holes down but I’m just compressing the leather around the riveted areas with some hammer strikes and averaging out the impressions slightly from there. This step was aided due to the leather still being slightly damp and pliable from the shene stage. Each center plate is different so take be aware of this when assembling. I picked one of the side panels and am starting from the bottom with the first center plate. I’m setting the rivets flat here which isn’t my favorite method but it gets the job done. When the first rivet is set I’ll add the second plate and a long double cap rivet through all three layers and continue to the third plate. Unfortunately at this stage my camera’s memory card filled up during the recording so there is a portion of this assembly process I can’t add to the video. When I finished adding all three center plates to one side panel, I repeated the process for the opposite side panel starting at the bottom again. The assembly of the remaining plates is very much like the helmet assembly if you need additional demonstration. When the panels are assembled, you’ll need to determine how you want to adjust and hold the bracers on while wearing them. I’ll probably demonstrate buckles in the next tutorial, so I decided to go with eyelets here. Eyelets are a quick and simple addition. All you need is a hole punch, in this case the largest size of the interchangeable tubes in my hole punch works just fine, and a setter. There are foot press attachments and at least a couple other types of setters so your application process may vary but all there is to it is to support the top of the eyelet so it doesn’t smoosh flat and to curl the bottom of the post out over itself a bit to form a tight friction fit into the hole. When the eyelets are all set you can lace it up however you like. Criss cross, over under, from the top or bottom, just go with whatever you want. I’ll show you a couple examples of lacing as well. Both will be about 45”. For one bracer I will lace it up with a leather lace that was cut from latigo leather, and the other will be laced with some paracord. You can us anything sturdy really. Synthetic options like paracord or shoe laces are easier to lace up and tighten. And leather lace will make the adjustments hold in place better. While wearing them you can tuck in the excess. You can also follow Prince Armory on Facebook which is currently our largest platform for a little bit of everything including general updates and pictures of custom work and occasional WIPs and teasers and more. Our patreon is small but there is a lot of behind the scenes and other content planned for it. If you make this or other projects from the tutorials, I’d love to see it! Mention or tag Prince Armory on Twitter to show off your work on this this or other projects and we might feature it in a future video! And check out Instagram for a cool stream custom projects past and present. And of course the Prince Armory website has loads of content including custom ordering information, albums, blogs, and more. For the next tutorial I expect I’ll do a pair of shoulder spalders in this Fantasy armor theme, but I still have to finish part two of the Tiger Dragon helmet build, and I have a couple other videos in the pipeline as well. I will also be working on my custom projects which take most of my time. The plan though is to pull back the curtain and start doing more project videos and shop vlogs in real time. Thanks for sticking all the way to the end of the video. If you’re watching this video as it just came out there’s a pretty good chance you were already subscribed so as a thanks to you being subbed be sure to check the description for how to get the pattern for free. I’ll do a 3 day giveaway for this one and then I’ll take down the giveaway. If you’re watching this video after the give away is over be sure to sub and click the notification bell so you can catch the next giveaway!